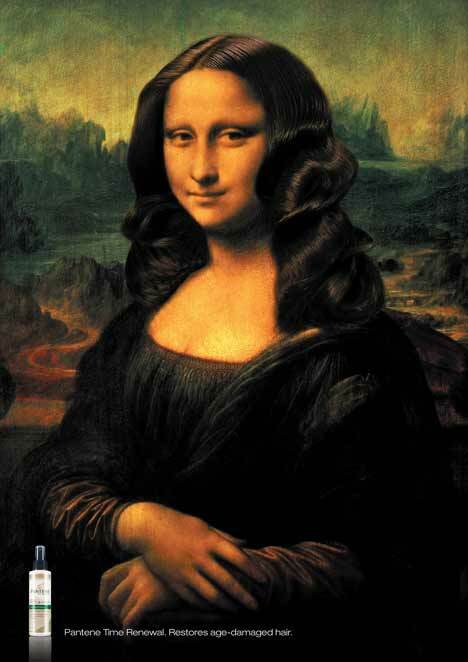 Pantene, the Procter and Gamble hair product, was connected with Leonardo Da Vinci’s masterpiece, Mona Lisa, with this plug for Time Renewal products in Australia. The copy: “Pantene Time Renewal. Restores Age Damaged Hair”. The Time Renewal advertisement was developed at Grey, Melbourne, Australia by creative director Anthony Shannon and art director/copywriter Julie Matthews.